$subscriptionID = "<Enter your Azure Subscription ID>"
$sqlDatabasePassword = "<Enter a Password>"
$httpPassword = "<Enter a Password>"
$nameToken = "<Enter an alias>"
$resourceGroupName = $namePrefix + "rg"
$sqlDatabaseServerName = $namePrefix + "sqldbserver"
$sqlDatabaseName = $namePrefix + "sqldb"
$sqlDatabaseConnectionString = "Data Source=$sqlDatabaseServerName.database.chinacloudapi.cn;Initial Catalog=$sqlDatabaseName;User ID=$sqlDatabaseLogin;Password=$sqlDatabasePassword;Encrypt=true;Trusted_Connection=false;"
$cmdCreateLog4jClusteredIndex = "CREATE CLUSTERED INDEX log4jlogs_clustered_index on log4jlogs(t1)"
$cmdCreateMobileDataClusteredIndex = "CREATE CLUSTERED INDEX mobiledata_clustered_index on mobiledata(clientid)"
$hdinsightClusterName = $namePrefix + "hdi"
$defaultStorageAccountName = $namePrefix + "store"
#To allow other Azure services to access the server add a firewall rule and set both the StartIpAddress and EndIpAddress to 0.0.0.0. #Note that this allows Azure traffic from any Azure subscription to access the server. # Create block blob objects referencing the source and destination blob. 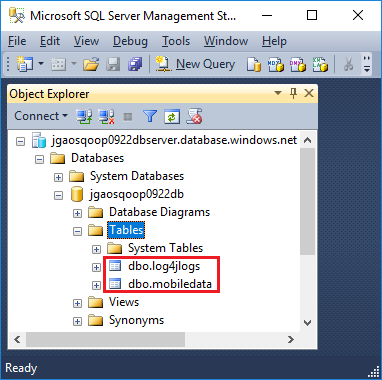 # Connection string for Azure SQL Database. # Connection string for SQL Server. # Uncomment if using SQL Server. -Command "export --connect $connectionString --table $tableName_log4j --export-dir $exportDir_log4j --input-fields-terminated-by \0x20 -m 1"
-Command "export --connect $connectionString --table $tableName_mobile --export-dir $exportDir_mobile --fields-terminated-by \t -m 1"
-Command "import --connect $connectionString --table $tableName_mobile --target-dir $targetDir_mobile --fields-terminated-by \t --lines-terminated-by \n -m 1"